Which White is the Right White? Say that 10 times real fast. The last time we caught y’all up on the master bathroom the walls were ready for paint. Because our tile is gunna be pretty colorful, (OOOPS, said too much about that already), we thought that we’d do solid white walls. I’m not really a big fan of white walls. I know every hipster-home-tour featured on Apartment Therapy has plain ol’ white walls. I need warmth, not sterility. But it’s a small room, and even with the one little window, we’re gunna need all the light we can get in there. and like I said earlier……. And, of course, Mr. Lauren does do some beautiful colors…….especially whites. 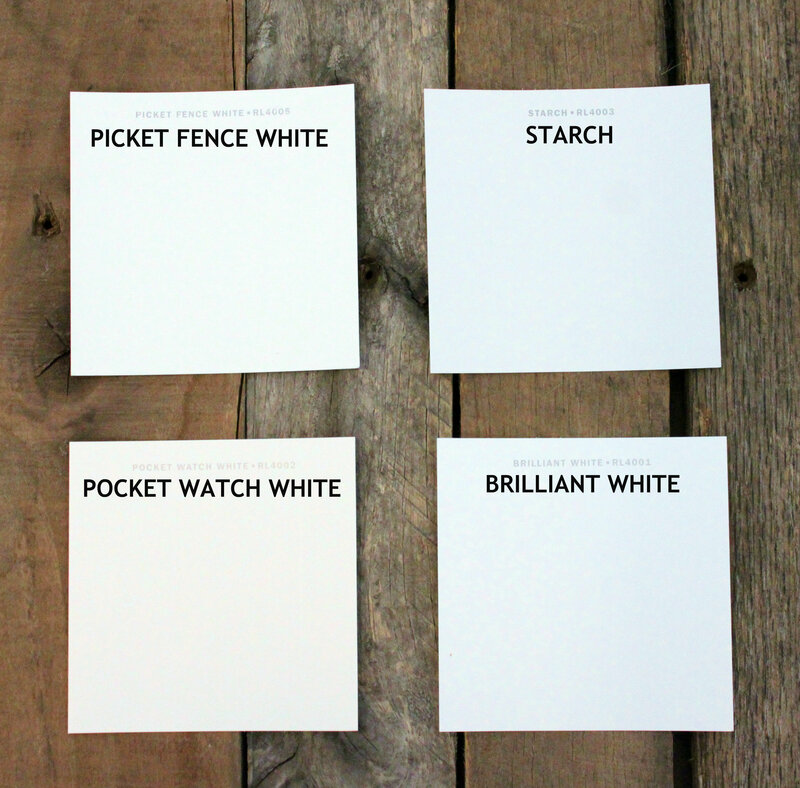 We brought home a few testers of whites and slapped them on the wall. Aren’t they all so drastically different? Well, much more so in person. 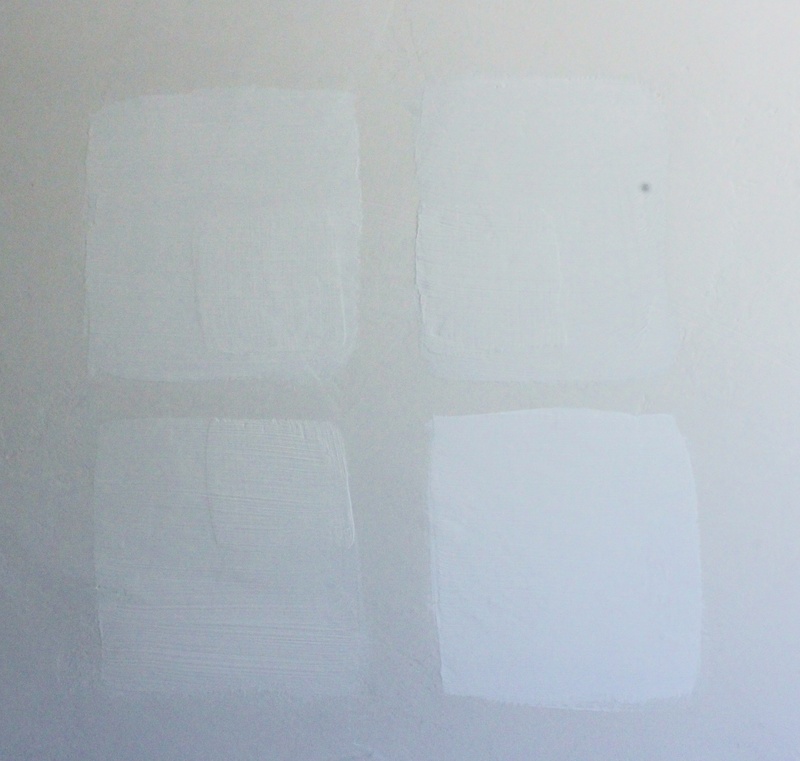 And here they are with the overhead light on…..
“Brilliant White”, the one in the bottom right corner. 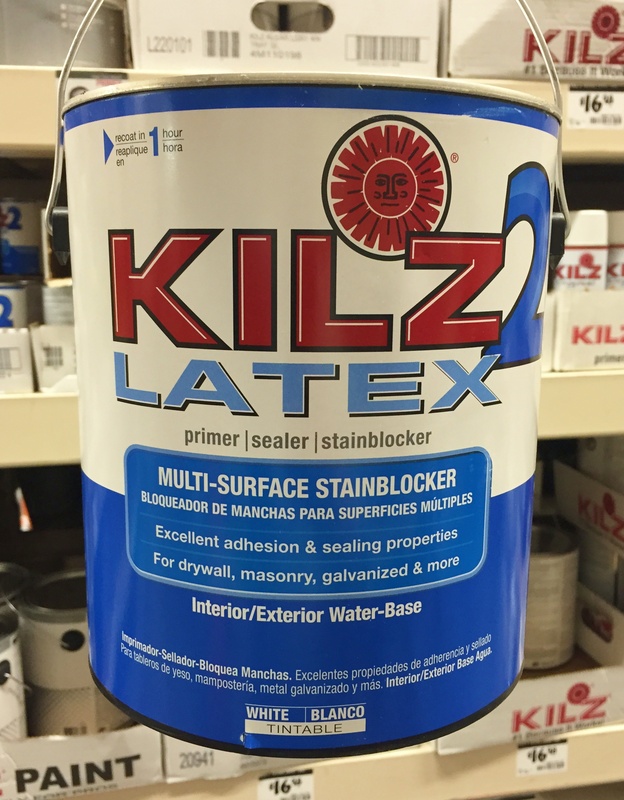 To make our white even more white…I primed every surface with Kilz 2 Latex Primer. 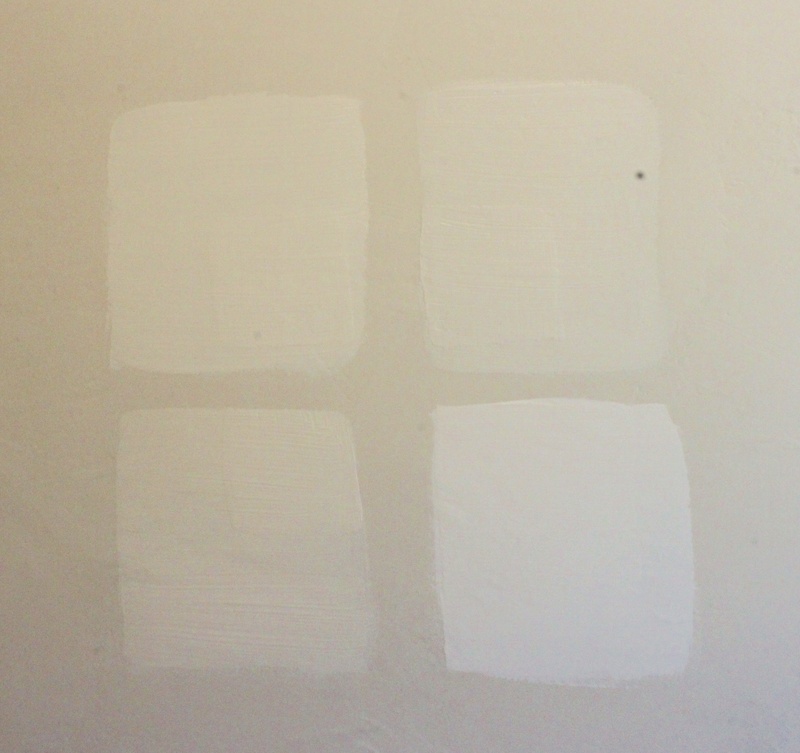 After the Kilz comes a few coats of Ralph Lauren Brilliant White….in flat. Never, NEVER, NEVER in Semi-gloss. Sure, the “part-time high school kid working in the paint department” at the Home Depot will tell you that semi-gloss paint is better in a bathroom or kitchen. But he’s wrong. Soooo VERY wrong. Semi-gloss paint on walls looks institutional; like a hospital room or reform school….or, better yet, a McDonald’s. The next time you’re at a fast food restaurant, take a look at the walls. Semi-gloss….I guarantee you. You’re better than that. We both are. And we all deserve soft, light-filled spaces to live in. 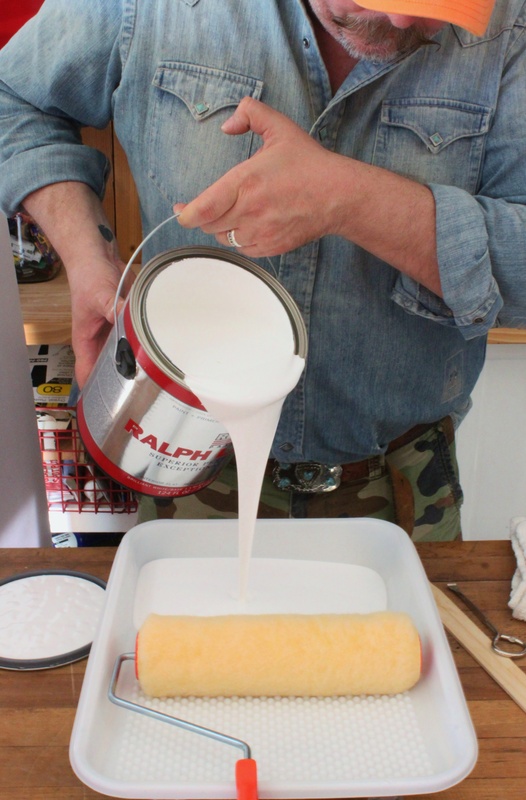 Notice how I use that “W” painting technique they always preach about on HGTV shows…..
After 2 coats of Kilz primer, and 2 more coats of Ralph Lauren Brilliant White. 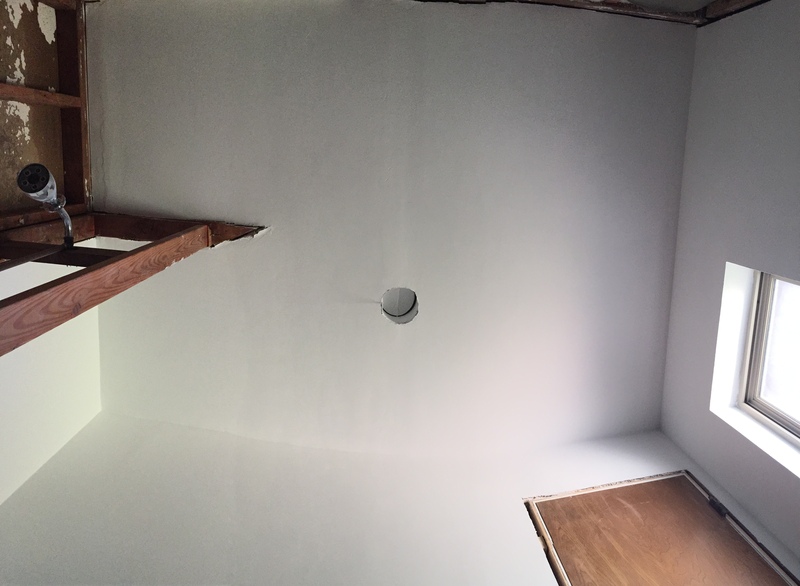 We were left with this (Iphone panoramic) awesomeness…..
And how about that ceiling? But it’s a giant step of progress to us. Stay tuned. 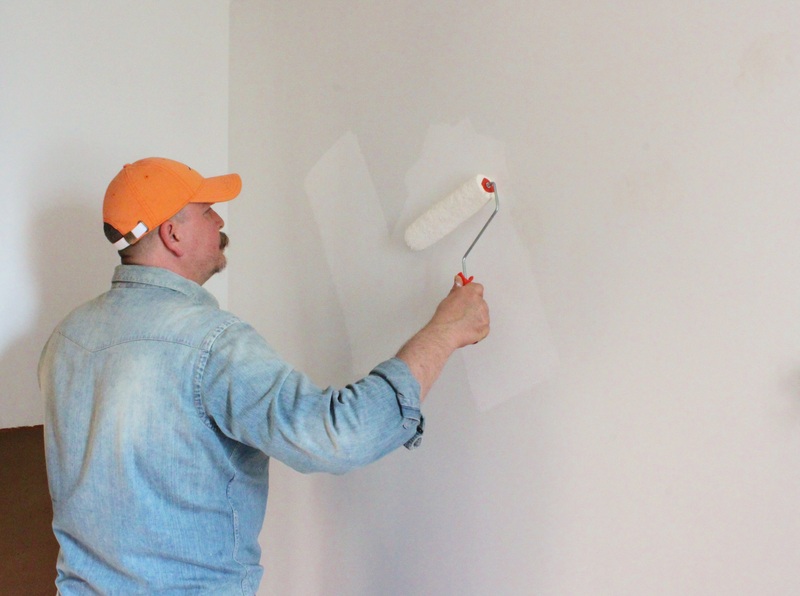 Because this project is really on a roll now…..
I’m right there with you on flat paint for bath and kitchen. Somehow you’ve pulled ahead of me on our respective bathroom projects. I’m painting today. I can’t wait to see your big reveal. Great choice, I would have gone with “pocket watch white” for sure had I not looked at the samples on the wall. Well done! HA @ wanting the can in the garage. There’s nothing wrong with buying a product for its packaging. I should know.